Fishing bear at Brooks Falls. Brooks Falls is a waterfall located within Katmai National Park and Preserve in Alaska. Located on the Brooks River a mile and a half (2.4 km) from Brooks Lake and an equal distance from Naknek Lake, the falls are famous for watching salmon leap over the 6 foot (1.8 m) falls to get to their Brooks Lake spawning grounds. 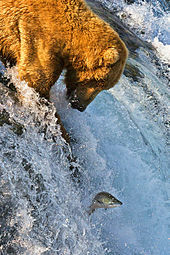 Consequently, large populations of brown bears and grizzly bears are attracted to feed on the spawning salmon. Brown bears usually congregate at the falls in July and early September, and many well-known photos of bears have been taken there. Bears in July are the greatest concentrations seen at any year at the falls; up to 25 bears have been seen at one time at Brooks Falls in that month. In September, a smaller number of bears (maximum about 18 at one time) can be seen at the falls to feast on the later salmon runs. July and September are by far the best months for viewing grizzly bears in the Brooks Camp area. Brooks River and Falls with viewing platforms. Naknek Lake is to the left and Lake Brooks to the right. ^ "Jumping Sockeye Salmon Brooks Fall Katmai National Park". Alaska in Pictures. ^ "Brown Bears at Brooks Falls". National Park Service. ^ "Fishing". National Park Service. ^ Bennett, Bo (2000). Rods & Wings. Anchorage: Publication Consultants. p. 148. ISBN 9781888125627. ^ "Story of a House" (PDF). National Park Service. ^ "Brown Bears of Katmai". Katmai National Park and Preserve. National Park Service. Retrieved 4 March 2013. ^ Ringsmuth, Katherine (2013). At the Heart of Katmai: An Administrative History of the Brooks River Area, with Special Emphasis on Bear Management in Katmai National Park and Preserve 1912-2006 (PDF). US Government Printing Office. pp. ix, 11–15, 20–23, 68, 70, 93, 114–115, 211, 241, 243. ISBN 9780979643279. Retrieved 27 August 2018.